Providing Secure & Confidential Shredding Services to Individuals and Organizations since 1977. Secure & Confidentil Paper Shredding Services, Document Destruction Services, Media Destruction Services serving New York, Long Island, New Jersey and Connecticut since 1977. While items are waiting to be shredded they should be stored in some kind of security container so that any information contained within remains confidential. Data Shredding Service, Inc. offers two types of secure containers to help our customers secure their confidential material prior to shredding. Our shredding bin is the perfect fit for busy offices. 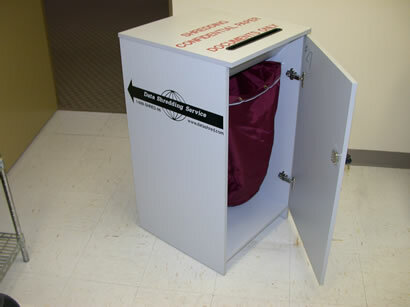 Offering large storage volume and a slim, mobile design our shredding bin will store your document's securely. When the shredding bin is full Data Shredding Service, Inc. will swap the full bin with an empty bin. The contents of the full bin will be shredded either on-site or at our shredding centers. In either case the contents will be shredded by an automated process negating the need for the material to be handled or sorted by human hands. 64 gallon size shredding bins.VIew of the top of a 64 gallon size shredding bin. View of the top of a 64 gallon size shredding bin. The shredding consoles offer less storage volume than our shredding bins but offer a more stylish design. When the console is full Data Shredding Service will collect the contents of the console and then shred the material. Shredding console for use in office environments. Shredding console open to show where documents are stored prior to destruction/shredding..
For large purges or warehouse locations we offer large volume shredding "Blue Bins". 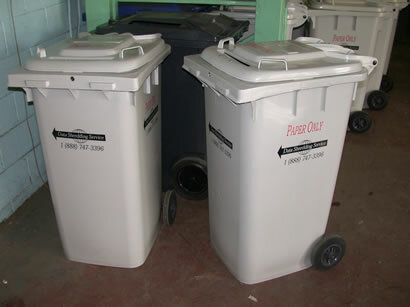 These large blue bins hold a large volume of documents. The blue bins are on wheels for mobility. These bins are lockable for security while the documents inside are waiting to be shredded and destroyed. Large volume capacity shredding "Blue Bin". COPYRIGHT © 2013 - 2017, DATA SHREDDING SERVICE, INC. ALL RIGHTS RESERVED.